To cap-off a lukewarm domestic run, Inter head North to Turin to face Juve in the Derby D’Italia. Match on Friday at 20:30 CET. 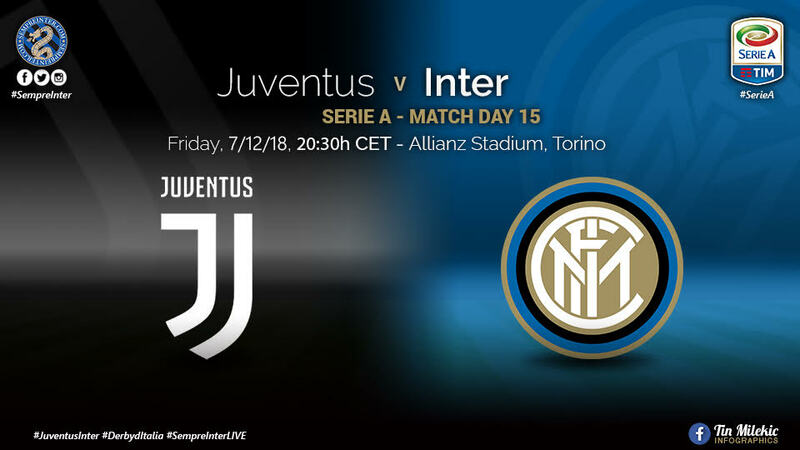 With Juventus seemingly having run away with the scudetto already, it will be up to Inter to put up the latest challenge to the champions in trying to maintain some semblance of competitiveness in the race this season. With Juventus having won all their league matches with the exception of one draw, it will be more than a challenging task for the visitors to try and take away points at the Allianz stadium. Inter’s recent run of form has been less than desired. With disappointing losses in the Champions League against group favourites Barcelona and Tottenham behind them, the Nerazzurri now look to the match in Turin to help reset the season’s trajectory. Taking points off Juventus will not only reignite Inter’s own league standing ambitions, it will also reignite the race for the scudetto with Napoli and also boost Inter’s morale ahead of the decisive midweek match against PSV in the Champions League. It is almost a certainty that Luciano Spaletti will set his side up with the standard double-pivot midfield of Marcelo Brozovic and Matias Vecino, the duo will be tasked at breaking down Juve’s attack building midfield, and also to support the wide defenders as they attempt to deal with Cristiano Ronaldo and Paolo Dybala’s expansive threats. Centrally, it is more than likely that Milan Skriniar and Stefan DeVrij can deal with the Juventini threat, but one must remember Cuadrado’s long-distance winner from a couple of years ago to head the concern that Juve are a threat from everywhere. This must be a match where Inter put forward the same desire and combative spirit shown in last season’s home loss, but the performance must also be built on tactical discipline and awareness by both players and coach. Radja Nainggolan was partially training solo as late was Wednesday so don’t expect the Belgian gladiator to make the trip to Turin. Dalbert’s injury is expected to keep the Brazilian full-back out until after the new year. The biggest question mark regarding team selection will be whether the experienced but out of form Ivan Perisic will start on the left flank ahead of the in-form but defensively liable Keita Balde. Probable Inter line-up: (4-2-3-1): Handanovic; Vrsaljko, de Vrij, Skriniar, Asamoah; Vecino, Brozovic; Keita, Valero, Politano; Icardi. Last 10 Head to Head: There is a clear edge to Juve over Inter over the last ten matches; the team from Turin has beat the Nerazzurri five times, while Inter have just one solitary win. Mauro Icardi: There is no doubt that Icardi is a fan of scoring against Juve. Inter’s talisman will need to provide more than just his lethal goal-finding abilities to this match if Inter are to enter with any chance of winning the match. This will be a match where Icardi will have to put on display his ability to link up play over and above his goal scoring abilities. Prediction & scorers: Juventus 2-1 Inter with Icardi finding the net. Concluding remarks: Unlike recent Inter opponents Barca and Tottenham, Juventus are less about moments of exceptional skill or event attractive football, but more of a relentless machines that does everything well over the entire 90 minutes with no mistakes. Inter will have to mirror that type of performance to get anything out of the match.